According to Mary Cuff’s latest article in Modern Age, “Is it Time for the Robert Penn Warren Option?”, such a stance is possible for “only the most privileged people” who can “afford to quit their jobs and their urban and suburban lifestyles to become gentleman farmers living off the land.” For it is impossible to retreat from modernity into the forest of intentional living and working. But even if one could, his state would not last long, as inevitable forces would corrode his utopia in due time, whether through economic bankruptcy or cultural wear. The problem, for Cuff, lies deeper than economic privilege. The call to return to the land and the actual return to the land are futile if “mainstream thought” remains “unconverted.” Influencing how Americans think, not how they work, must be the ultimate goal. Cuff lauds the poet and literary critic Robert Penn Warren as the exemplar of this mental agrarianism. The two-time Pulitzer-winning author of All the King’s Men, who came to see his earlier association with the Twelve Southerners as a futile response to WWII’s mass mobilization, managed to adapt to the postwar industrialism while still harkening back to his old values. (Cuff does not mention this, but part of that adaptation involved leaving his position at Louisiana State University, where he founded The Southern Review, for the University of Minnesota and then Yale University.) Warren succeeded, Cuff writes, because he did not praise “ideal” local communities and instead wrote of men and women tumbled headlong into the modern world yet still bound to their pasts and places. By following Warren’s lead, we may thus reconcile both the present and the past, the ideal and the real, through sheer literary—mental—effort. When one roots oneself into this life, the agrarian thinker falls into a “world,” a “rhythm” of thought, and in a “fundamental sense” the thinker is not is not at all “in command of this hidden law.” Strictly speaking, the thinker is not having a so-called experience or explicitly ‘thinking’ in the conceptual or valuative sense. As the farmer does not consider his agriculture an ‘agrarian experience’ but the simple fact of his work, likewise the truly agrarian thinker operates without attention to conceptual constructs of the agrarian ethos, value, or even history. Rather, he lets the world in which he lives guide him through practice, repetition, and habitation—what the later Heidegger would emphasize as dwelling. In this sense, Heidegger does agree with Warren in seeing that “agrarianism is just a word.” But whereas Warren aimed to move past agrarianism to the concepts and values which undergird it, Heidegger argued that agrarianism itself is an abstraction, that what matters is not the values of agrarianism but the life from which agrarianism derives its values. to keep one’s distance from the life of the peasant, to leave their existence more than ever to its own law, to keep one’s hand off lest it be dragged into the literati’s dishonest chatter about ‘folk character’ and ‘rootedness in the soil.’ The peasant doesn’t need and doesn’t want such citified officiousness. What he needs and wants is quiet reserve with regard to his own way of being and independence. For Heidegger, it would be wiser for one unacquainted with the work of the peasant to keep quiet rather than pretend to promote the latter’s thinking. For thought is only accessible in its fullness through dwelling, a specific dwelling which is shaped by the land and, in return, safeguards it from harm. And if such existence is ignored, as Cuff allows it to be, then the worst is bound to happen. Heidegger attacked those from the city who thought they knew the country, most often the skiers and, in 1934’s Germany, the Nazi propagandists promoting the so-called Volk, who took their superficial experiences of rustic living as actual attachment to the rural life. In fact, they were only treating the countryside as a recreation center. Though they left the city for a time, the world of the city never left them. 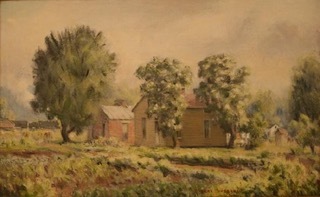 Heidegger asserted that “such goings-on destroy more in one evening than centuries of scholarship about folk-character and folklore could ever hope to promote.” What is required is not “chatter” about values or restorative experiences in the country but rather the quiet tenacity to continue the agrarian life in the face of modernity. In light of today’s already-modernized world, it may seem Cuff’s ‘Robert Penn Warren Option’ is more viable than Heidegger’s path of “quiet reserve” and devotion to one’s place. But would taking Cuff’s path lead beyond the superficial praise of the country life or the values which undergird it? Or would it in the end reveal itself as only the plundering of pasts, histories, and places in the service of a selfish desire for catharsis and self-actualization? 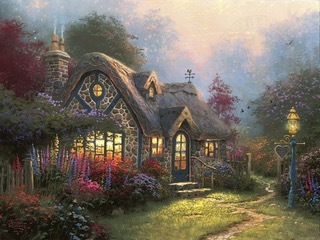 Those in favor of “internalized agrarianism” must answer those concerns, as the answer means the difference, for example, between the work of Thomas Kinkade or Harlan Hubbard—a sentimental lightness abstracted from reality, or a stern simplicity pervaded by the place around it and in turn giving light to its impressionistic actuality. Many find Heidegger difficult to hold up as any kind of laudable example. He remained in the Nazi Party until the end of WWII and never publicly apologized for it, and his obscure diction seems ill-suited for any peasant. He himself might not have cared. What mattered to him was not the “astute report” of literati about him but the memory of his fellow-peasant friends, as he emphasized throughout his article, not the accessibility of his thinking but that his thought contoured to the pattern of life in his homeplace, which he tried to continue throughout his life. But those unacquainted or uncomfortable with Heidegger may look to the American agrarians who have argued and lived the same, perhaps in ways better than Heidegger himself. Thomas Jefferson was among the first, as he worried that a truly democratic America could not exist unless populated by yeomen who owned their own property, worked their own fields, and took responsibility for their own homesteads. Republican values, for Jefferson, did not exist apart from republican work. Victor Davis Hanson, the classicist and California raisin farmer, has continued that tradition today in The Other Greeks, where he finds that the pillars of Western Civilization were built not by the Athenian urbanite but by the Greek γεωργός. For it is the uncouth farmer, he who “cared little for dress, shunned the palestra and gymnasium,” he who “judged the sophist in the assembly by the same yardstick” as his land and vines, he who only walked into town to vote, who therefore was the true progenitor of the Western mind which “speaks his due, fights his own battles, and leaves an imprint of self-reliance and nonconformity, a legacy of independence that is the backbone of Western society” (5-6). Heidegger, Jefferson, and Hanson agree that one cannot think (or vote) well if one does not work well. And this is but a recognition of what Aristotle argues in Book I of Nicomachean Ethics, that it is necessary for a thinker to “be cultivated by fine habits”—only these “fine habits” are tending to the work of one’s hands rather than attending the theater. It is the opposite insight of Cuff: doing, not thinking, is the foundation of agrarianism. The hope is that in light of doing,πράξης, thinking—and above all, wisdom, φρόνησής—can be restored. 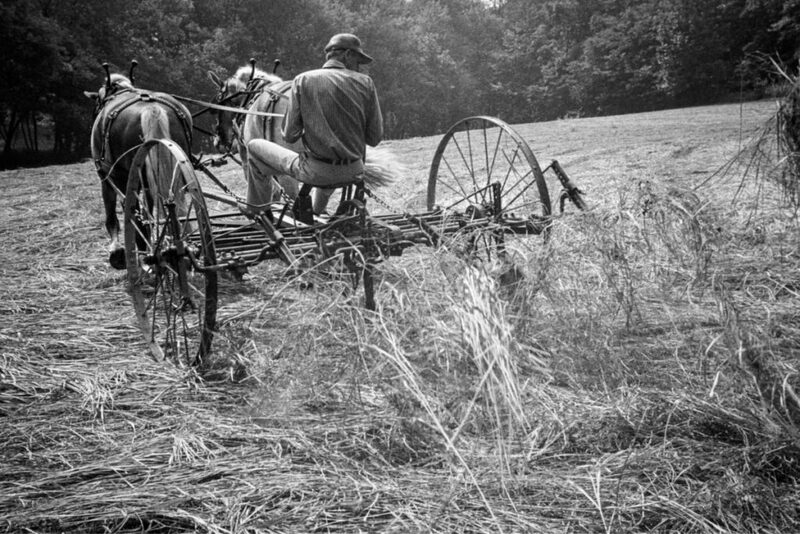 Finally, we may look to Wendell Berry himself, the poet farmer—a title which might have made the later Heidegger an envious admirer—whose main criticism of the Southern Agrarians was that they left home. In “The Regional Motive,” Berry contrasted the “mind of the South,” which could happily move on up to northern universities, to the “land of the South,” which demanded the “particularity” of personal virtue and work. Because the Southern Agrarians loved the South mainly for its “historical associations,” they were shackled to a sentimentality that thought “history makes the grass green whether the land is well-farmed or not.” Their promise was thus doomed from the start, a doom which actualized in their move from the South to northern universities, leaving behind a South still in need of stewardship. In light of this critique, one might wonder if Warren wholly succeeded in his career. He was a fine writer and thinker. He earned his two Pulitzers and brought the tragic character of American history to the fore of many students’ and readers’ minds. But what if, for instance, he had not left LSU for Yale? The latter has never suffered for a lack of award-winning professors, while today the former is better known for its football team than its intellectual legacy. 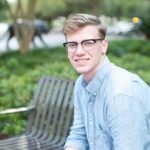 In part, this is due to a self-forgetting of its golden years during which Warren, Cleanth Brooks, and Eric Voegelin walked shaded under that campus’ stately oaks. But had these three men and others remained in place, would they have been influenced further by the oaks and cypresses and swampy waters of Louisiana and the ways of its people? And would they in turn have influenced its people and history and perhaps even its geography further? Since Warren and others “internalized” this place and its values, we will never know. But Martin Heidegger knew his work and his place, and so in his case we do know the answer to those questions. His remains rest in the earth of the Black Forest in his hometown of Messkirch, where today many still travel to visit that small hut in the mountains in which he did his work. Even with his moral failings, Heidegger stands as one of the greatest thinkers of the 20th century. And while it might be more convenient for the scholar in some ways, one cannot divorce his thought from his time, place, and the role he played in them, as it came bound to the earth upon which he was grounded. Is that not the most ironic lesson of the 20th century—that its deepest thinker was one so unlike the century’s character of uprooting? “Accepting the truth that we all have a past and a place,” as Cuff states, is indeed an important part of living, but so is accepting that we have a present and a place, and only one present and place, which demand from us the task of being and working. Responding faithfully to this demand in turn makes our thinking better. Heidegger’s word of warning, that only being and working in a very specific kind of place allows one to think well, is a hard word. But it is a word our deracinated culture needs to hear. “Internalized agrarianism” is a necessary component of agrarianism proper, but it fails when it becomes a substitute for it. Agrarianism would seem to require both things to do and a place to do them. The specifics will no doubt vary from person to person, but the mentality and the inner push for activity shouldn’t. If your internal agrarianism isn’t prompting you actually to do something I’d argue that it needs some tweaking, because in that instance it would seem to be nothing but theory. In considering Berry’s critique of those Southerners who “left,” it might be profitable to look at the work of one who didn’t, Andrew Lytle, who stayed in the South and remained a committed agrarian. I’ve not read much of his work, other than a few essays and short stories, but his memoir A Wake For the Living seems to be highly regarded and may be a good place to start. If your internal agrarianism isn’t prompting you actually to do something I’d argue that it needs some tweaking, because in that instance it would seem to be nothing but theory. Thank you for your helpful comments and recommendations, Rob. I certainly don’t want to do away with thinking, and therefore the ‘internalized agrarianism,’ either—perhaps a reason why the agrarian life has suffered is because so many who had spent generations on the farm never thought about the worth of that existence and therefore never knew what they were losing when they decided to leave (if they did decide to leave, that is; I understand many were forced off their property). For another recommendation, I’d like to suggest also Ernest Gaines, who stayed in Louisiana and taught at UL-Lafayette for many years. Jeff brought him to mind during the editing process of this essay. Thanks, Casey. My comments were intended to support what you were saying as opposed to Cuff’s more theoretical approach. My point was simply that the thinking must involve doing, or it’s more or less vacuous. It is precisely this observation that puts the lie to charges of agrarian “romanticism.” How many times have Berry and others said that a full-on agrarian life is not for everybody? I might counter that many did not leave something that was valuable, but rather left something that in many cases had already been lost. If daily toil and striving is romantic, only then is the agrarian life properly called romantic. As a farmer who chose to abandon armchair agrarianism, I can say my experience confirms this. I’m reminded here of monastics whose chief job is prayer, yet they also keep themselves physically busy. I’m mostly familiar with the practices in the Christian East, though I imagine there are plenty of similarities to Catholic monasteries. In designated times of prayer, they make the sign of the cross, prostrate, chant and sing. There is always incense and candles. When at work between services, they are always praying. It is either prayer expressed physically, or work infused with prayer…all day. The emphasis changes, but the mind, heart and body are always working in concert. This is of course an ideal for non-monastics as well. But they have dedicated themselves specifically to this task of “reintegrating”. In our disintegrated, dissociated, disembodied age, it does the soul good to find some way of getting our hands our dirty. I’m a localist, but not an agrarian, so much of this discussion isn’t at all my fight. But it must be said that if we want to focus on economics, then the fact is that “only the most priviliged people” can enjoy contemporary urban living. You have to be really, really, really rich to live in our major cities, and you have to have lots of really, really, really poor people around you to make your lifestyle work. The overwhelming majority of people have a much higher standard of living in the suburbs, which is why there is constant flight to them, so much to the point that having depopulated the countryside so much, urban cities are now dependent on mass immigration to keep themselves functioning. There needs to be more direct effort to demonstrate to those in the suburbs that moving to small towns doesn’t mean you have to be “a gentleman farmer” and you can see a further bump in life quality–you won’t have to pay all the time and money to commute into the city, for instance. I see much of the focus on agrarianism in order to attack advocates for small, local life as an attempt to convince people that small towns aren’t a viable option. If I had to settle for small-town localism as consolation in the fight for the agrarian, then I think I’d consider that in part a victory. Nevertheless, I think if we remain content with Cuff’s prognosis, then we’ll have a nation of urbanites reading Berry or Warren while trying to keep up with the cost of living in the city. I think there needs to be some discussion of how living and working on the land, or at least in the rural setting, affects one’s thinking (and voting and loving and dying, etc.). Those in favor of small towns, like you said, can take part in that discussion. The growth of the suburbs and the expansion of urban sprawl have in many instances changed the dynamics of the small town. One of the very simplest distinctions is that of small towns that are far enough outside any nearby urban influence so as to remain mostly rural, vs. those that may have once been so, but have been absorbed into, or at least strongly influenced by, the urban/suburban sphere. It would seem to me that many people of an agrarian bent who cannot or do not want to farm would nevertheless be able to live out their agrarian “dream” in the former, residing in close proximity to the rural and contributing to the community in other ways. The area that I’m most familiar with, western Pa. and eastern Oh., is replete with such small rural or semi-rural communities. That’s the thing–I don’t agree with her prognosis because I don’t agree that agrarianism is something to prioritize. It’s certainly not something that is, or is going to be, relevant to any significant portion of the population. As far as I can tell, it mostly appeals to academics, and especially to academics who want to attack localists as impractical dreamers. I don’t see this statement as anything other than a bait and switch intended to tell people they have to stay in the rat race, that there’s no hope to head for the country, to a small town, for a simpler, happier life. And in so doing she is just completely, totally, factually, economically, and morally wrong. Do agrarians tend “to attack localists as impractical dreamers”? As an agrarian, I admit that that sounds like a dark-as-the-depths-of-hell kettle calling the pot black. No, sorry if that sentence was unclear. Agrarians are localists who prioritize agriculture-based lifestyles. But there’s another group of people, anti-localists of various sorts, who love to talk about agrarianism not because they are in favor of it, but to claim it is representative of localists and to attack localism of all sorts. “Oh, you just want people to all be small farmers. That’s never going to happen, therefore you are unserious and can be ignored.” So people like Cuff use agrarianism as a club to beat localists with, and justify ignoring/ridiculing localists, distributists, etc. This is a rich and thoughtful short essay; thank you for sharing it. 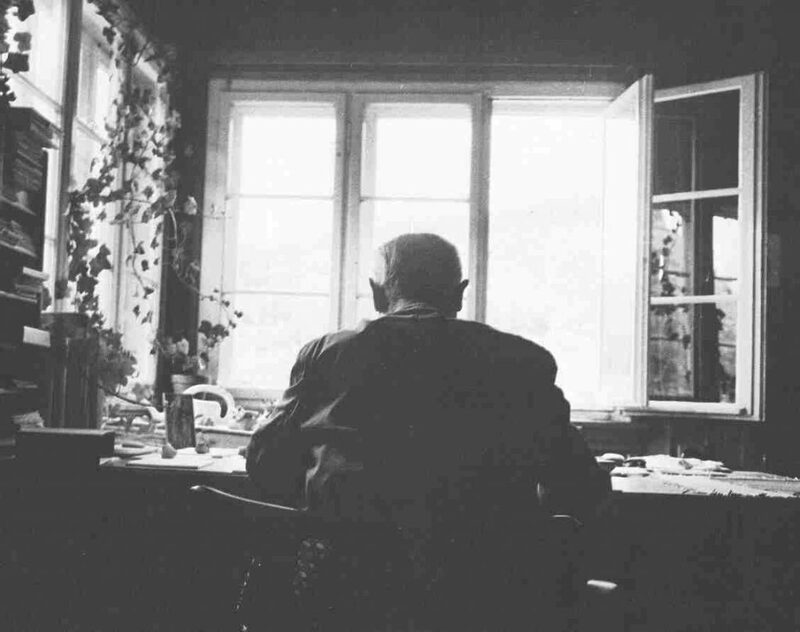 The work of thinking, for Heidegger, had to be “intimately rooted in and related to the life of the peasants”….What mattered to him was not the “astute report” of literati about him but the memory of his fellow-peasant friends, as he emphasized throughout his article, not the accessibility of his thinking but that his thought contoured to the pattern of life in his homeplace, which he tried to continue throughout his life. 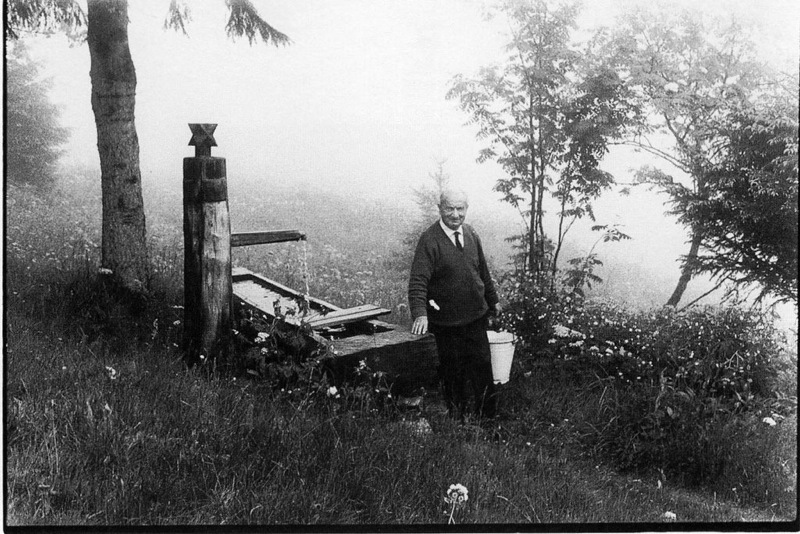 I used to read quite a bit of Heidegger, and even wrote a little about him back when I thought my academic life might go in a different direction than it has, but I confess I know nothing about his actual social life in the Black Forest. Did he, in fact, have friendships among those he referred to as “peasants”? The question occurs to me because what is presented in these two passages of yours suggest a tension: thinking in ways that are “related to the life of the peasants” and that are “contoured to the pattern of life…of his fellow-peasant friends” do not seem to me to be the same thing. The former implies, in my reading anyway, a real involvement in the life of another; the other, for of an observation of it. Heidegger may have condemned the skiing visitors from the city, but how much was he a “visitor” himself? Yes, he actually lived there; he stayed in the provinces; presumably he could speak about patterns of life in a way other visitors never could. But if his philosophy was only something shaped by those patterns of life, as opposed to something that organically emerges from living, or at least sharing in that pattern of life, how much difference is there between Heidegger and the visitors? How much can “the world in which [the thinker] lives guide him through practice, repetition, and habitation” if the daily, quotidian “work” of the thinker is utterly separate from the work of those he lives among? I’d have to go back to Heidegger’s “Dwelling, Working, Thinking” to push this possibility further. Also, the fact that you put forward agrarian thinkers like Jefferson, Hanson, and Berry as ones who possibly lived our Heidegger’s reflections better than he himself did or could is interesting, since Heidegger’s use of “peasant” invokes an aristocratic perspective (even if it doesn’t partake of it entirely), and in Jefferson’s, Hanson’s, and Berry’s though you can find very different takes on the place of the aristoi. Hanson seems to defend them explicitly; Jefferson railed against the existing types of them–which was one of his main arguments with John Adams–but nonetheless imagined that properly organized agrarian communities would organically lead to the emergence of local, democratic equivalents of the same. And Berry? I’d like to measure the bone-deep respect and absolute priority which Berry gives to what we could call “peasant knowledge” (the local knowledge of a place) against the “aristopopulism” which Patrick Deneen has recently defended–maybe they are fully compatible, but then again, maybe not. Is aristopopulism another–no doubt better, but still limited–way for visitors to dwell among the peasants, let the observed routines of peasant lives benefit and exercise some control over their thinking, but still stay apart (and thus more influential) than they? I don’t know. Again, something to think about! Thank you for these excellent comments, Russell. As you can see, this is his anecdote. But if read charitably, at least, we can trust Heidegger was involved in the life of the villagers whenever he went to Todtnauberg. When at the university, he would keep wearing his peasant dress during lectures (a big faux pas at the time), and throughout his life he lived simply, never getting a radio or, if I remember correctly, even a typewriter. Now, I don’t think he was as involved in rural life as Berry is, but I don’t think he was a hypocrite, either. I think one can point to how his philosophy was truly shaped by the peasant life by looking at the first steps of his philosophical investigation in ‘Being and Time’: he began with a phenomenology of instrumentality, stating that human Dasein exists most primordially by engaging with beings as instruments in use for a task at hand, not in treating them as simply objects that are present-at-hand. I think that’s a fine illustration of how one’s work influences one’s thought. Your second point is very interesting. Heidegger’s philosophy, especially in the second half of ‘Being and Time’ and his essay “Introduction to Metaphysics,” certainly has an aristocratic flair to it. Specifically, I’m thinking about the role of historical exemplars for the Volk to follow in realizing their own existential possibilities. Heidegger certainly thought only a few privileged ‘existential’ men would transcend the chatter of Das Man and lead others into greatness. But he himself came from peasantry and, apparently from this article, preferred it (eventually) rather than trying to be that aristocratic leader for others. I wonder if there could be a way forward by thinking about geography: the Black Forest of Germany, in many respects I imagine, might have shared some of the rugged and stubborn democratic qualities of its southern neighbor, Switzerland. Hanson himself has sometimes pointed to the Swiss as one of his examples of rural individualists who reflect the true Western character. And Hanson, in ‘The Other Greeks,’ praises Laertes in’ as an exemplar of the ‘aristos,’ as he works side-by-side his slaves and tends to his own household. Therefore, I think the place of the ‘aristoi’ in the political context of this agrarianism would require geographic proximity to the populace and, above all, working side-by-side with them in daily labor. Christopher Lasch’s discussion in ‘True and Only Heaven’ on syndicalism and the relationship of managers, workers, and producers might help here. I think Deneen would do well to include this discussion in his further defenses of aristopopulism. Hope these comments clarify and spur on further thinking! By all means, let us, once again, romanticize the simple peasant. Let us philosophize while in a stupor. Let us pretend Jefferson was a farmer, howbeit failed, when he was a supervisor (not very good), and for all his genius, a most impractical man. (And, yes, I admire him for other reasons, and keep a framed picture of him on my study wall. But I know his limitations.) Let us pretend Martin Heidegger was less prescient, and did not foresee the inevitable end of National Socialism, and maneuvered to get out of dodge, or Berlin, while there was still time. And if we are going to include Hansen and Berry as the intellectual farmer category, why not also Niccolo Machiavelli, who during his banishment, worked his property (as an overseer), and returned to his room at night to bask in the company of Livy, Virgil, and Cicero. Now that I am retired, I can finally, truly, enjoy the Squire’s Life. For, ultimately, that is really what it’s all about. Not to farm, but to be the Proprietor of a farm. Not to get out and busy gathering eggs before dawn, but to sit on my front porch swing and sip coffee as the dawn comes up gently over the mountains. Then, me and my obnoxiously devoted canine will go for a tramp about, me picking up burrs in my socks, and him darting thither and hither digging for gophers. But about this recent mania for “aristopopulism”.. What an oxymoron! The “Elites”, suddenly realizing their wealth, their power, and their privilege are suddenly on the block (chopping, not auction), are trying to make a case among Conservatives for their preservation? That s small female bartender from New York can cause such a panic grants her too much power, methinks. The “Elites” already control most of the “Conservative” think-tanks and media, what have they to fear? (Other than the Disaster in DC giving a bad name to “Conservatives” who abandoned principle to pursue power?) Besides, the Constitution — that forlorn document more worshiped than read by “conservatives” — is against such. I think Heidegger’s argument is precisely that the agrarian life is hard work, not at all romantic, and would rather be left to itself rather than romanticized by those who don’t know about it. But he also argues that it’s a life that opens up pathways of thinking that are not accessible by simply reading Berry’s poetry or Heidegger’s philosophy or the articles here on FPR. I don’t want to impose too much into your own situation, David, but to take it as an example: I’m not sure the “Squire’s Life” would be such a reward if not preceded by a life of hard work—we have plenty of people these days sitting around who lack the wisdom of the old man sitting on his rocking chair, and there’s a reason for that. Perhaps that should be a lesson to those too eager to fancy themselves squires and overseers—whether conservative or liberal ones—before earning their due. I was drawn in by this well-written article, especially its care in carefully negotiating the boundaries between Agrarianism and its call to action for our time. But how can Jefferson and the Agrarian spirit possibly be yoked to Heidegger’s thought without blurring essential distinctions between European anti-modernism and Jeffersonian Republicanism? If one joins the author in concluding that Heidegger’s error or danger is a moral failing rather than intellectual, but that is precisely the probative question. The European peasant and the American farmer may coax food from the ground but they are not, politically speaking of the same stock. The cult of the European peasant is at its core a retreat into a radical historicism that reduces the whole to time and place, soil and blood. This is a questionable endeavor in both the philosophical and Biblical traditions but absolutely understandable when one is attempting to plumb the depths of a European university system wrestling for more than a century with Hegel’s system. The Anglo-American philosophers simply walked around it. More importantly, when Heidegger came of age during WW1, peasant chic was a general fashion that had to be addressed by left and right. Humanist philosophers like Ernst Cassirer wrote on myth as did Heidegger’s epigones from Evola to Eliade. Political thought itself was mythicized in the process. Some aspects of the Lost Cause myth of the Confederacy may have contributed to European thought but the South for all its political challenges was planted root and stock in Jeffersonian soil and had no reason to look to Europe as a political guide. Attempts to transplant volkish anti-modernism in the American heartland by those like Gerald K. Smith, for example, were doomed. It is a plant that does not flourish in American soil. This is a good and fair critique. I don’t mean to bring the American agrarians and the European Heidegger into total comity. There are distinct differences between the two. But I would argue that Heidegger is not representative of European volkish anti-modernism, at least not totally. If you can get your hands on his article I discuss (“Why Do I Stay in the Provinces?”), you’ll see that he attacks these volkish romantics throughout—the skiers, the promoters of ‘folk values’ and ‘rural experiences,’ etc. And to offer just one possibility of how there is convergence in the thinkers listed here: both Hanson and Heidegger look to the pre-Socratic Greeks as progenitors of the West. Hanson takes a more economical and practical view to them, whereas Heidegger takes a far more poetic and philosophical view, but the convergence remains. And one last small point: Heidegger drew just as much from the Biblical tradition, arguably more so, than the Hegelian. He was first trained in Catholic theology, then became an expert on Luther in his early career after he converted to Protestantism, and remained interested in theology (though subtly) throughout his philosophical career. Hopefully these comments show that Heidegger should not be cast in the shadow of European peasant mythology. His historicism’s relationship to American agrarian thought remains as a good question, however. But I’d also argue that there is an element of ‘historicism’—though we need to define that term better—in the thought of thinkers like Berry and Hanson, though probably not Jefferson.